There are an amazing amount of health properties of beets. Best of all, these delicious vegetables are easy to put on the table because they are so versatile. Beets are one of the most nutrient rich vegetables available. Because they are such a powerful cleanser of the body they should be eaten in moderation. Vitamin A helps keep the immune system strong and healthy. Vitamin B-6 is has an important part in processing the amino acids of the body as well as maintaining a healthy neurological system. Iron is an important part of a healthy body and especially a healthy circulatory system. This mineral helps the blood transport oxygen to the cells to keep them healthy and working properly. Beets are used to detoxify the body. 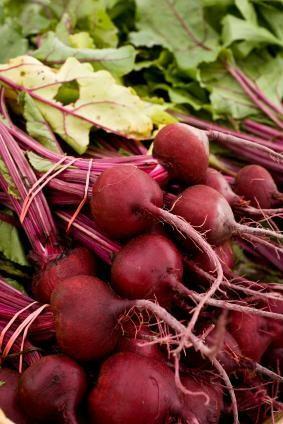 They are most nutritious when eater raw or used as a beet juice, but they are high in nutrients in any form. Beets are usually not a favorite food. The much maligned beet is too often boiled to tasteless oblivion, over salted, or used when it is old. Beets can be delicious when they are fresh and cooked correctly. Always look for firm beets with a shiny skin underneath the clinging dirt. The beet leaves, or greens, should be fresh looking as well, not wilted. Fresh beets are easy to cook. The flavor and nutritional value of fresh beets are much better than canned beets as well. Beets are naturally sweet and the sweetness is intensified when they are roasted. If you haven't liked beets try roasting rather than boiling. It is easy and changes the flavor completely. Just peel the beets with a vegetable peeler and trim off all but about one inch of the leaves. Cut large beets in fourths or leave small beets intact. Drizzle them with olive oil and place in a 400F oven until they are done, about twenty minutes. Keep an eye on them so they don't burn. The health properties of beets are a good reason to eat them another good reason to eat them is that they are just so good. Adding beets (cooked, raw, or in juice) to your diet a couple of times a week can make a difference in your energy level and overall health.